This heart tattoo idea started out a bit less involved than where we ended up, but that is how tattoos go sometimes. She had a letter from her dad with his signature at the bottom, "Love Dad" and she wanted to do a heart beside it, and wanted it over her heart for placement. 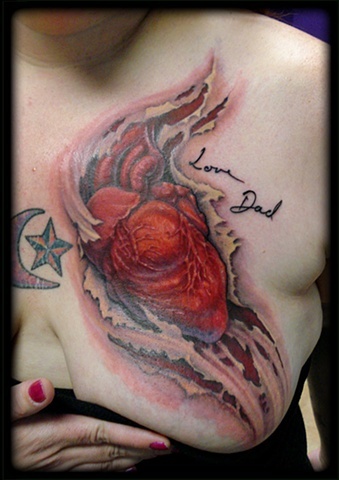 After some discussion, we went for the anatomical version of the heart, tearing through her chest, with the "Love Dad" tattoo still showing on her skin where it looks like it had been all along.